Here you see the summation of my cutting and gluing fun in the hardcover book I paint in, table top photography on a cloudy day, and photo editing in PicMonkey. designs cut out from American magazines. First I found the larger than life red Lego block in the bottom right hand corner. Then I continued to browse through my magazine collection searching for objects that pleased me, but the objects only pleased me if they were in the colors red, blue and green. I worked on pages previously painted dark green with smatterings of brown and dark blue made by stamping those color paints with bubble wrap. I used PicMonkey to add the matted frame and to attempt some sharpening of the photo, because try as I might I was unable to scan the two pages but had to photograph them instead with an iPhone. 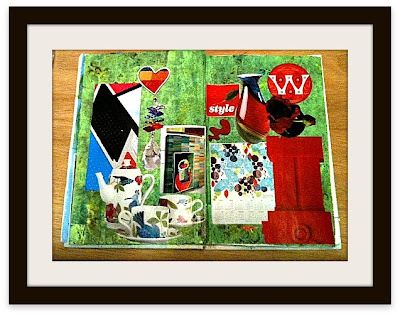 ~Cheryl Gee is rather particular about her collages. "Red Piece" was one of those works where she was just going with certain colors and balancing the shapes, not trying to make any meaning out of it at all.